Babies strive to communicate with their parents and other caregivers long before they can speak. Often, babies will feel frustrated at their inability to let their parents know what they want, which can cause tantrums and other forms of Acting Out. Many parents have found that by teaching their babies to use sign language, they can cut down on the frustration that their baby feels and improve communication. Most parents use some sign language with their babies, even if they don't realise it. Babies routinely wave bye-bye, nod their heads in a yes or no manner, and lift their arms above their heads when they'd like to be picked up. These actions are universally understood and allow parents to communicate with their babies in a non-verbal way. That's sign language, at least in how it applies to babies. While there are a number of good books offering signing suggestions for Communicating With Babies, many parents learn to sign with their babies by simply observing the baby and picking up on the ways that the baby already attempts to communicate. Some babies may touch their mouths when they are hungry or pat their nappy when it is soiled. When noticed by observant parents, these messages can help to give baby what they need without difficulty. It doesn't really matter that the signs used in your household aren't the same as other people choose. What matters is that you and your babies can "talk" long before they have the ability to use words. The types of sign language typically used by adults are too complicated for babies. At a young age, they do not yet have the understanding or the physical dexterity needed to sign in the traditional manner. They can, however, make simple gestures to indicate their wants and needs. Book sellers and libraries carry a good selection of books on the subject. You can start using signs when your baby is a newborn, reinforcing them as the child grows. Consistency is key in teaching your baby to communicate with you through the use of sign language. Try to use the sign for desired words every time that you say them, so that your baby will learn to associate the sign with the word. Babies learn best through repetition, so look for opportunities to sign. It is important to get your whole family involved in signing, so that your baby can communicate with older siblings, minimising the frustration for both children. Before long, your baby will be signing to let you know that she is thirsty or tired. In fact, most children will know and use a few signs by the time that they are 7-8 months old and may have a "vocabulary" of 50 words (or more!) by the time that they are blowing out the candle on their very first birthday cake! While some parents choose to teach their babies a large number of signs, most find that selecting the words most important to babies and toddlers works best. Hungry, thirsty, tired, up, down, hot, cold, all gone, help, and ouch are good for starters. You can teach your baby to identify body parts merely by pointing to them. With time, your baby will be able to tell you when they are hurting. For example, by doing the sign for "ouch" and then pointing to their ear, you will know that your baby has an earache. This method sure beats worrying about a Crying Baby and guessing as to what might be wrong. Concerned parents may worry that by teaching their babies to use sign language to communicate, they will delay the development of speech. After all, if baby can get her needs met without saying a word, why would she? As logical as this argument sounds, the opposite is actually true. 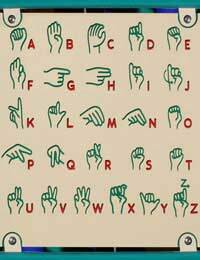 Studies show that children who first communicated through sign language are often ahead of their peers in speech development. As they build up a good collection of words, most babies drop the signing.